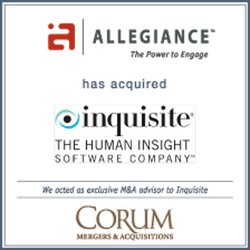 Corum Group Ltd. today announced the acquisition of its client, Inquisite, Inc. ("Inquisite"), of Austin, Texas by Allegiance, Inc, of Salt Lake City, Utah ("Allegiance") on July 13, 2009. Allegiance acquired the shares of Inquisite in a strategic transaction, thereby expanding their voice-of-the-customer solutions through software M&A. Corum Group Ltd., the global leader in merger and acquisition services, specializing in serving software and information technology companies worldwide for nearly 25 years and with offices in eight countries, advised Inquisite in the transaction. "Innovative companies go to all lengths to stay in touch with the opinions and attitudes of their customers," said Adam Edmunds, CEO of Allegiance. "Inquisite solutions add an interesting dimension of self-created and self-administered survey tools. These, combined with Allegiance's centralized listening platform and analytics tools, provide unprecedented options for today's smartest businesses to assess, monitor and respond to customer needs." Allegiance, Inc. offers next generation feedback management software to help organizations grow customer and employee loyalty and engagement. The Allegiance Engage Software platform facilitates survey creation and gathers responses and unsolicited comments in real-time into a centralized online system, saving time, effort and money. Allegiance solutions measure customer and employee engagement, revealing precise actions to grow engagement and increase revenue. Allegiance Enterprise Feedback Management (EFM), predictive analytics, and professional services combine to help businesses capitalize on engagement. Inquisite provides comprehensive solutions to facilitate the gathering, understanding and acting upon business-critical data, getting the right information to the right people at the right time. Leveraging Inquisite, critical data can be easily integrated with existing business processes and systems, providing enterprises with the confidence to make the right business decisions to drive their business forward. Headquartered in Austin, Texas, Inquisite sets the pace by providing the best combination of enterprise power, operational simplicity, and measurable value. Across every industry, hundreds of leading organizations around the world use Inquisite for their mission-critical customer and employee loyalty initiatives. Corum Group Ltd. is the global leader in merger and acquisition services, specializing in serving software and information technology companies worldwide for nearly 25 years and with offices in eight countries. Experience makes the difference with Corum having completed hundreds of software M&A transactions spanning six continents, enabling the firm to deliver a proven business process for its clients. Corum also educates the industry with its conferences and publishes the most widely distributed software M&A research. Corum's principals are highly experienced former tech CEOs, who are supported by the industry's leading researchers, writers and valuation experts. The company has spent more than US $20 million to build the world's largest and most comprehensive buyer database. This knowledge base combined with Corum's experience and industry expertise, consistently ensures unequaled success in client engagements. See http://www.corumgroup.com. www.corumgroup.comCorum Group Ltd. is the global leader in merger and acquisition services, specializing in serving software and information technology companies worldwide. Press Release AttachmentA leading provider of voice-of-the customer (VOC) solutions that help companies capitalize on customer and employee engagement. Press Release AttachmentProvider of Voice-of-the-Customer (VOC) and Enterprise Feedback Management (EFM) solutions that help organizations drive growth and increase profitability through improved customer and employee loyalty and engagement.